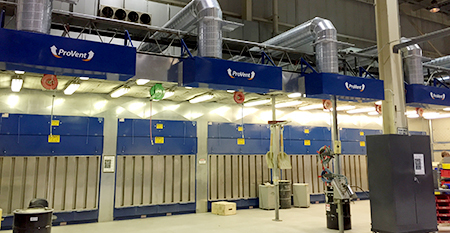 Fugitive dust, smoke and fumes are removed from the open production area and contained within the booth dust collection system. The Enviro-Cell eliminates the need for central dust safe working environment. Housekeeping is restricted to the interior of the booth. The work area is continuously cleaned by cartridge filters offering filtration capabilities of 95% efficiency down to 0.3 microns. Air discharge is recirculated back into the environment. Knocked down Booth Panels are custom designed to meet customer specifications. The compressed air manifold for filter blowdown is nested inside the unit for convenient system installation against an existing wall or corner. Pulse Controls are standard, complete with Photohelic Gauge monitoring, and supplied with a timer in a NEMA 12 control box. Motor controls, if supplied, are housed in the same control box for ease of connection. Standard system sizes range from 4,000 to 16,000 cfm, with custom capacities also available. 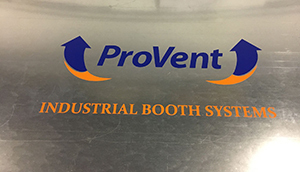 ProVent also manufactures a wet booth collection system for the containment of combustible dust which can be seen by clicking here. 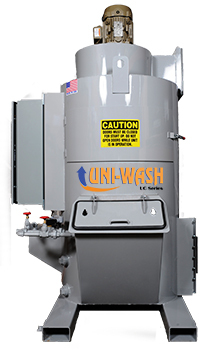 Call us today to find out more about how a booth dust collection system can be used in your application. Filter Cleaning (1) Digital Sequencer / Timer with Internal DP Switch for On-Demand and Off-Line Pulse Cleaning. Includes Digital DP gauge; (2x) 1" Diaphram Valves. External Coating Durethane DTM by PPG is a Direct-To-Metal Urethane Mastic Coating that is Chemically Resistant and Extremely Durable. It Provides Excellent Corrosion Resistance and has Superior Color and Gloss Retention, Excellent Adhesion, UV Protection, and is Abrasion Resistant. ProVent can design a custom booth for your application. Unique booth sizes and CFM requirements for difficult applications can be handled by our engineering team. Flush mounted booth lighting creates a bright work environment. A crane slot can be incorporated into any booth configuration. Silencers are available to reduce the sound of the exhaust air from the back of the dust collector. Booth panels built of 16Ga steel are available when extra strength is needed.